Home / The S&R Diet Explained / S&R Pizza Calories – How Many Calories in S&R Food? S&R pizza calories are calories well spent. Before anything else, please make sure you read this article first. This one too. 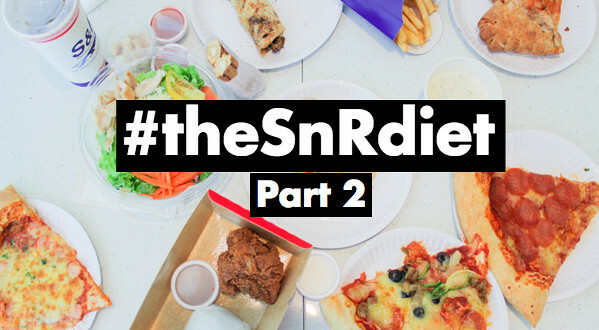 We outline why we created #theSnRdiet and how it may or may not help you. Again, we’re not telling you to eat pizza and calzones all day. The goal is to show how flexible dieting/IIFYM can be applied in lotsssss and lotsssss of different ways without forcing you to sacrifice your goals or sanity. Our definition of macro-friendly is a food item that has a balanced ratio of protein to carbs to fats, and satiating enough that you won’t feel like you just inhaled air. It has to be relatively filling and satisfying relative to the calories it contains. The chicken Caesar salad is predictably one of the best options on the menu. 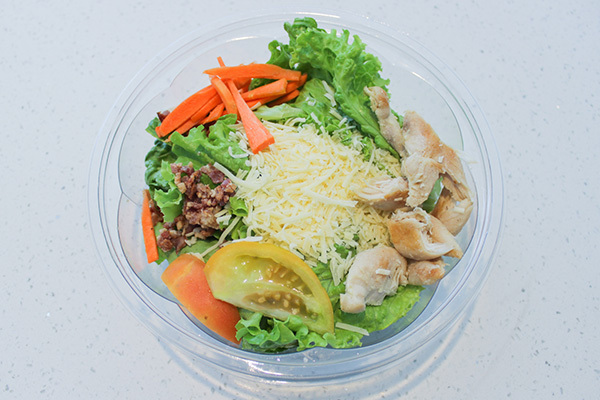 It can be your lowest calorie option (no dressing) or it could also be one of the high calorie options (with all the toppings and dressing). For almost the same amount of calories, I’d rather have a slice of pizza over the salad, but that’s just me. 🙂 Choose wisely! There’s approximately 40 grams of dressing per container, so going by the macros of typical Caesar salad dressings, that’s easily 15+ grams of fat. Add that to the bacon bits and shredded cheese that they put, your salad could easily have over 25 grams of fat. For protein, there are some chicken slices but the amount differs from branch to branch. Some will give 2 bites worth; some will give 5 bites worth. The carb content is low at 30 grams maximum even with the croutons. The shrimp adds a bit of protein but not enough to make a huge difference. However, the garlic and shrimp pizzas are pretty consistent from branch to branch—never too thick or too thin. It’s a safe choice for sure. Note: The best part about the pizza slices is you can see them from the counter, so you can adjust your choices based on how they’re made on that day by that specific branch. The thicker it is, the more carbs. The thinner it is, the fewer the carbs but it could also mean more cheese and subsequently, fat. 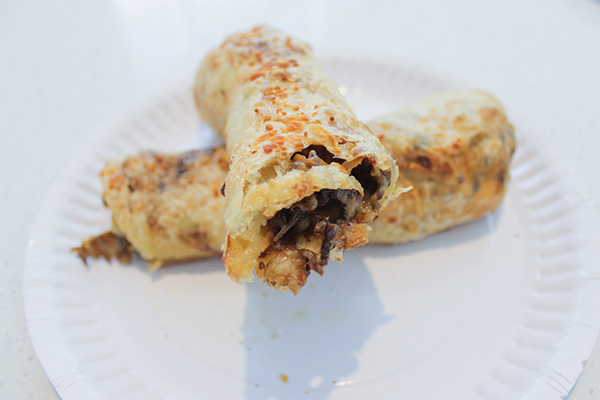 The beef baked roll was one of the surprisingly good ones. It wasn’t too oily, the bread wasn’t too thick, the beef was fairly lean, and there was just the right amount of cheese. We were fully expecting the beef baked roll to be one of the least macro-friendly but it ended up being the opposite. The 1-piece fried chicken with rice is ranked relatively well is because of its protein content. Also, while it is high fat by nature since the skin is on and it is deep fried, you can drastically improve its macronutrient profile just by not the skin. Yes, yes, the skin’s the best part (WE KNOW!!) but macro-wise, it’s for the best. 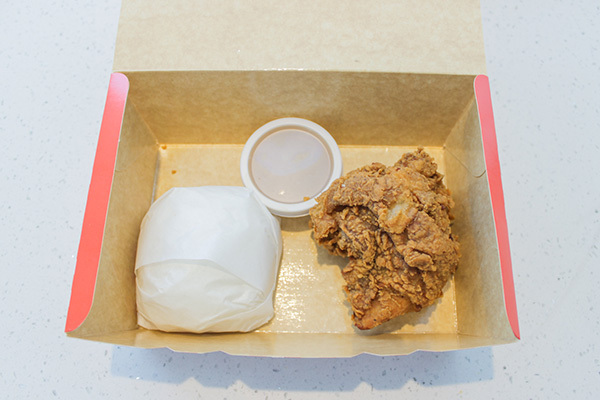 The 1-piece chicken meal has a better ratio of fat to protein compared to the 2-piece chicken meal since they never serve 2 big parts, just 1 big part and 1 small part. So if you ask for white meat, they’ll give you 1 breast part and 1 wing. The wing won’t have much white meat, but it will have skin and breading. If you eat all the breading and skin of both parts, you’ll be consuming more fat without really adding to the protein content. It ranks higher than the pizza slices because it has slightly lower carbs (~50 grams vs. ~70 grams). The cheese pizza slice is hit or miss. 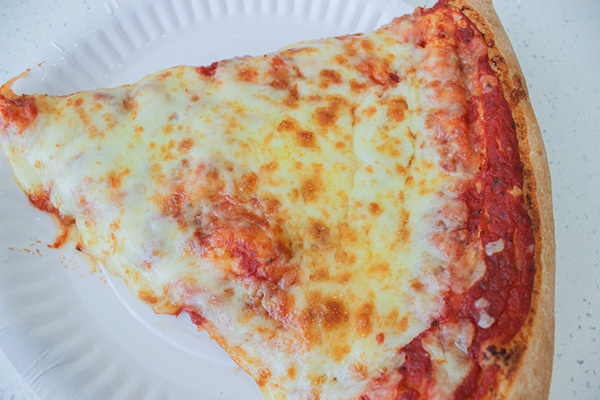 In some branches, they make it very thick—thick cheese layer and thick pizza dough. However, if you chance upon a thinner crust with a thinner layer of cheese, then the cheese pizza becomes very macro-friendly. You’ll want to blot the oil, though. The cheesier it is, the more oil you can blot. There’s added protein in the pepperoni and some of the excess oil will be cooked out of it. If you blot the excess oil with a napkin, you can get rid of most of the added fats from the pepperonis but you can still retain the protein content. Like the cheese pizza slice, the pepperoni pizza slice can range from super thin to hella thick, so adjust accordingly. 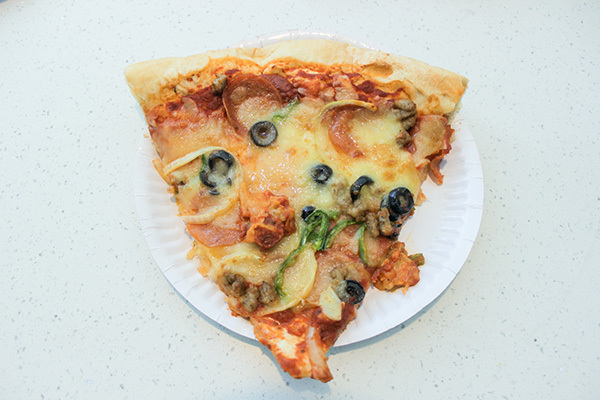 The S&R pizza calories may vary widely depending on the toppings. 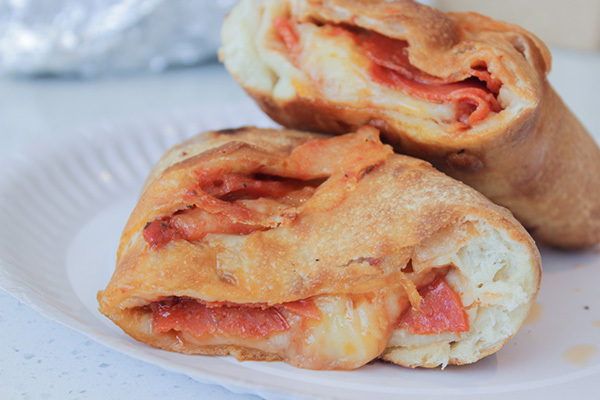 The calzone pepperoni is similar to a slice of pepperoni pizza, except the pepperonis are inside so the oil gets absorbed into the dough. You can’t wipe it off or blot the excess, unlike with the pizza. Also, the calzone pepperoni contains more carbs than a pizza slice since it has to be thick enough to seal in the cheese and pepperonis. 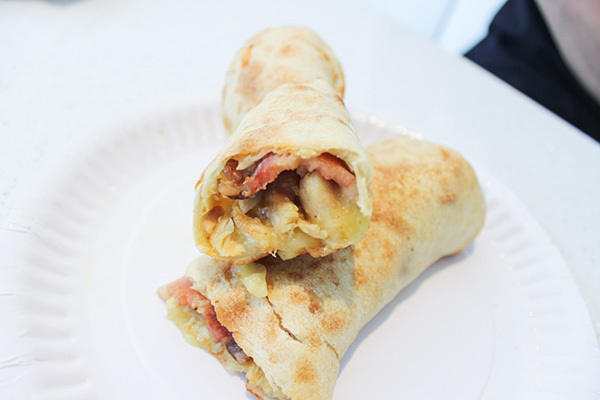 We’ve tried the calzone pepperoni at three different branches and they were all very, very oily. 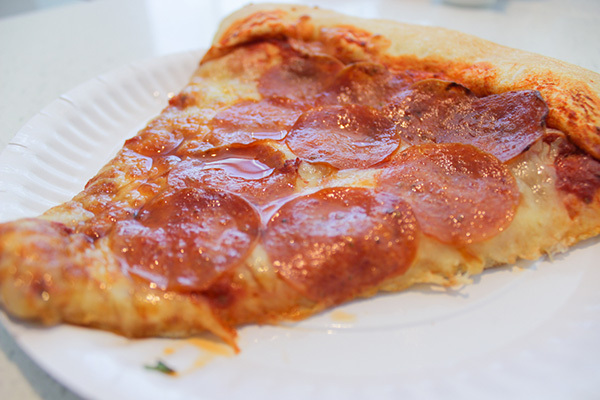 Go for a pepperoni pizza slice instead for essentially the same thing with fewer calories. There’s chicken, so it must be good, right? Wrong. The chicken baked roll was another surprise because we expected it to be macro-friendly, but again, it was the opposite. There was too much cheese and it was soaked in oil. Its only saving grace is the few pieces of chicken inside. We avoid hotdogs in general because you never really know what’s in it, but sometimes we do crave for it. 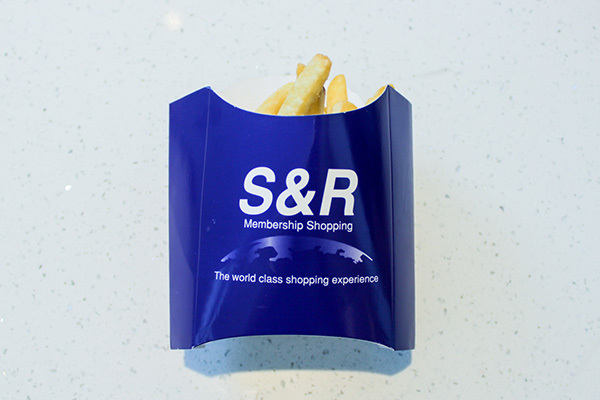 The S&R hotdogs are very basic, so unless you add heaps of mayo on top, the macros will always be the same from branch to branch. That said, the hotdog is mostly fat with just a little bit of protein. 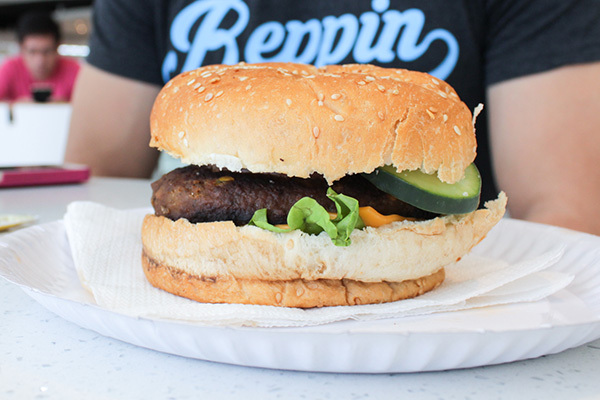 The texture of the patty looks a bit meatloaf-y so it’s hard to tell what’s in it. It’s probably not 100% beef and if it were, don’t expect it to be high quality beef or a lean cut. 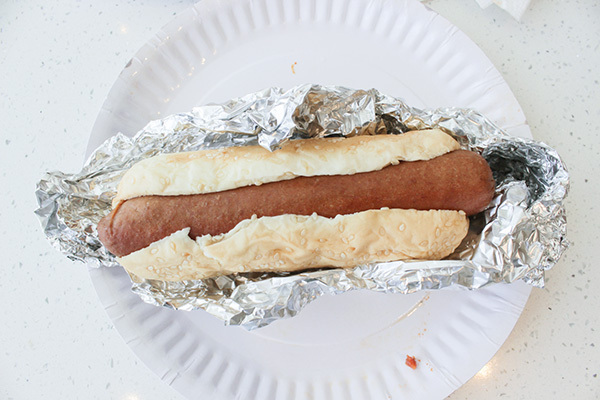 The S&R cheeseburger is therefore also classified as a mystery meat just like the hotdog. The hamburger bun contains more carbs than the hotdog bun though. It’s denser and heavier. Both the hotdog and cheeseburger didn’t do well on this list because there’s no way of knowing what’s in the hotdog or burger patty. The calzone vegetable may sound like a wise choice at first because it has vegetables so it has to be healthier than the others, right? However, it seems that any and all calories saved by incorporating vegetables is compensated for by a larger serving of cheese. It’s definitely cheesier and larger than the calzone pepperoni. This has a direct impact on its caloric content and macronutrient profile, making it higher in fat, protein and total calories. 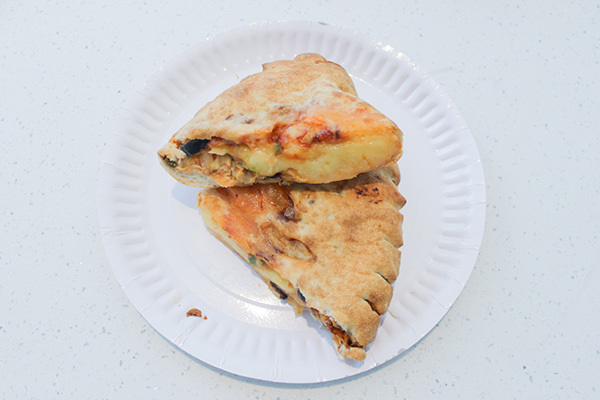 The combo pizza is similar to the calzone vegetable in that it has vegetables but it is also loaded with more cheese. 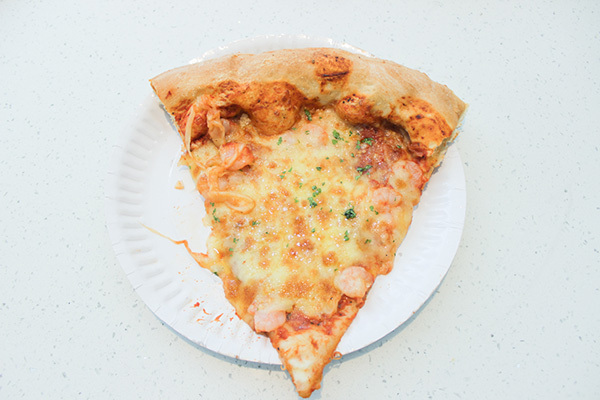 Unlike the pepperoni, cheese or garlic and shrimp pizzas, the combo pizza has 2 layers of cheese: one on top of the tomato base and then another layer covering the vegetables. The crust is also slightly thicker to accommodate the weight of the toppings so overall, the combo pizza is almost always the most calorie-dense among the pizzas. It’s our least macro-friendly because it’s high in fat and subsequently, high in calories as well. 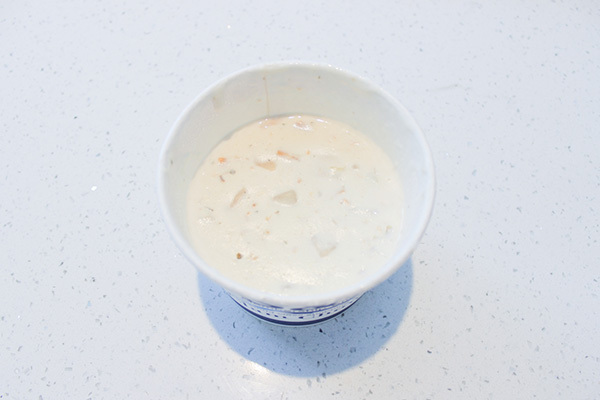 The clam chowder soup isn’t made from scratch. In fact, we saw them emptying out can after can into a big pot of soup and didn’t really do anything more to it after that, so it’s pretty much straight-out-of-the-can. We can’t remember what brand they use, but it’s definitely the full-fat variety. This isn’t any of those low-fat or fat-free clam chowders. You can tell it’s full fat just by how long it stays steaming hot even once it’s out of the pot. We’ll be updating this if I do chance upon the can again. The French fries are cooked well, so they’re not as greasy as others. However, they’re still deep fried so that means oil/fat content. Also, the fries are cut pretty thick, so it’s pretty dense in both carbs and fats. No protein here, which is why the clam chowder edged out the French fries ever so slightly. 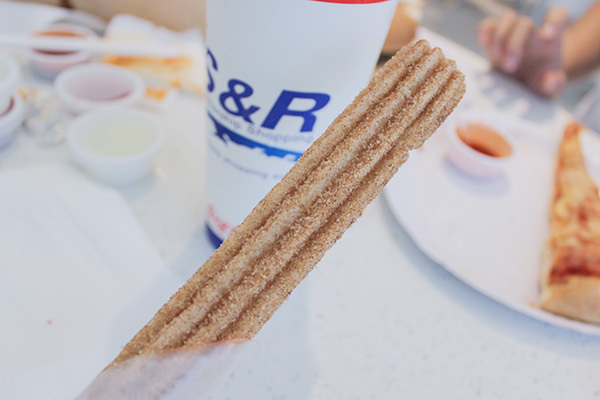 The cinnamon churro is just regular frozen churro that’a rolled in white sugar and cinnamon after cooking. It’s deep fried so there’s fat along with those carbs. However, it’s not that bad especially if you split it with someone. It’s usually not too oily either so that’s a plus. When properly deep friend, food doesn’t soak up that much oil. The cinnamon churro, if made well, can have a decent ratio of carbs to fats with minimal protein. Size-wise, it’s the same as the Disneyland churros so we use the macros for those whenever we have the S&R churros. The Bavarian cream filled churro doesn’t have a sugar coating on the outside unlike the cinnamon churro, but the cream filling makes up for the calorie difference due to the added fat content. The Bavarian cream filled churro is the same size as the cinnamon churro. 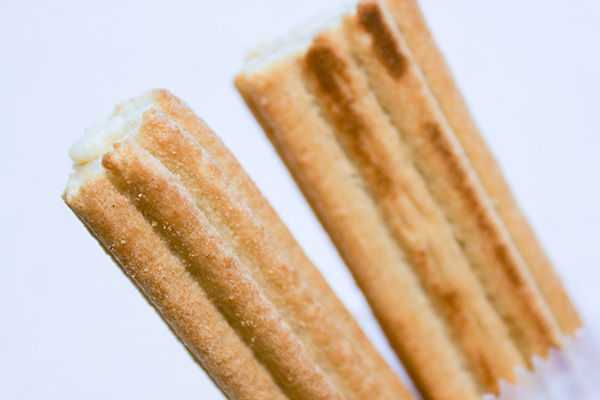 For nearly the same amount of calories, the two types of churros are neck and neck. Choose based on your personal preferences.